A graph showing college enrollment in the United States and given the Eurocrisis and low performing European colleges and universities, it would not surprise me if Europe had a similar situation occurring. 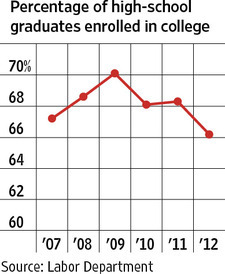 A 2012 report indicates that "higher-education officials are fretting about ominous signs that overall college enrollment is starting to drop." An American study found that forty-five percent of students achieved no significant improvement in their critical thinking, reasoning or writing skills during their first two years of college. After four years, 36 percent displayed no significant increases in these so-called "higher order" thinking skills. Students, particularly those who made poor college major choices, are angry that college does not adequately prepare them for the world outside of college and leaves them with a significant amount of debt. And there is plenty of bad news coming in when it comes to the issue of college/university Darwinist indoctrination as you will soon see. It is getting harder and harder to make a living as a evolutionary biology professor!